A fast moving river cascades over rocks near Milford Sound, New Zealand. I hadn’t eaten all day and it looked like I was going to, once again, miss dinner. But Milford Sound is such an incredible place that I didn’t care about going hungry. After all, I knew I’d be able to eat tomorrow. Of course that kind of certainty doesn’t exist for millions of people in our world, which makes it easier to put ones own difficulties into perspective. I think it’s good to be reminded of such things, particularly when you’re fortunate to live in a relatively affluent society. The above photo was made from a bridge across a fast flowing creek on the road into Milford Sound. Wind and rain come frequently at Milford Sound and, with no guarantee of great light at sunrise or sunset, I knew I needed to maximize whatever photo opportunities presented themselves to me during my short stay. I made the image at dusk prior to heading back to Milford Sound for a prolonged night photography session. I made the photo of the fast flowing creek near Milford Sound with my Sony a7Rii camera and Sony/Zeiss 16-36mm f/4 lens. I love working with that lens. It produces extremely sharp results, from edge to edge, right across the frame. The exposure time, in the fading light, for the image was 72 seconds @ f/11 with the camera set to ISO 100. Clearly a shorter exposure time would have resulted by increasing the camera’s sensitivity to light (i.e., ISO). However, I was interested in recording the movement of the water and am very happy with the ethereal quality in the image that resulted from the long exposure time. There was a reasonable amount of color in the trees, rocks and water. However, the shapes and textures in the above scene were ideal for rendering into a black and white photo. I knew that a black and white rendering would remove the scene from its reality and help me produce a more evocative image than would have been the case with a straight documentation in color. If color isn’t all that helpful to your image, it’s probably best to remove it. In doing so you’ll often amplify the other elements of composition within the scene. The remains of an old ship at low tide just outside of Bluff, right at the bottom of New Zealand. The photo immediately above was made on a rainy, dreary and dank morning on a beach on the edge of the industrial port of Bluff at the very bottom of the South Island of New Zealand. Frankly, it wasn’t at all pretty and I vividly remember standing for hours, on very sharp and slippery rocks, trying to make a handful of photos during persistent rain. However, by employing an extremely long exposure and removing all the color from these images, I’ve been able to move them to a place that seems to exist, somewhere, between reality and abstraction. It’s a very interesting place which I like to refer to as suggestion. What’s The Best Way To Make A Black And White Photo? Rather than setting my camera to Monochrome (i.e., black and white) I prefer to work with my camera set to RAW and then convert the original color file to black and white on the desktop. Photographing in color produces a larger file, with more information to play with on the desktop than would be the case with the camera set to Monochrome. (Incidentally, the Monochrome or Monotone setting on most cameras is a good option for those photographing in the JPEG exposure mode who do not want to spend time processing images on the desktop). Trees in snow, underpinned by classic composition, speak of the stillness of the moment on Huangshan (i.e., Yellow Mountain) in China. You can see how well suited this image, made on the slopes of Huangshan (i.e., Yellow Mountain) in Eastern China, is to a black and white rendering. From a traditional, fine print point of view it might even be considered a classic with a full range of tones from jet black to near white. Actually, most of the tonality is distributed through the mid tones, which makes it particularly easy on the eye and also allows me to enhance the enormous amount of detail in those areas of the image. Strong composition really underpins this image. As well as the textural qualities I mentioned you'll notice that the image is framed around the three dark tree trunks, which are organized into a triangular shape. Those tree trunks help concentrate the viewers attention into the two areas of the frame between those trees. 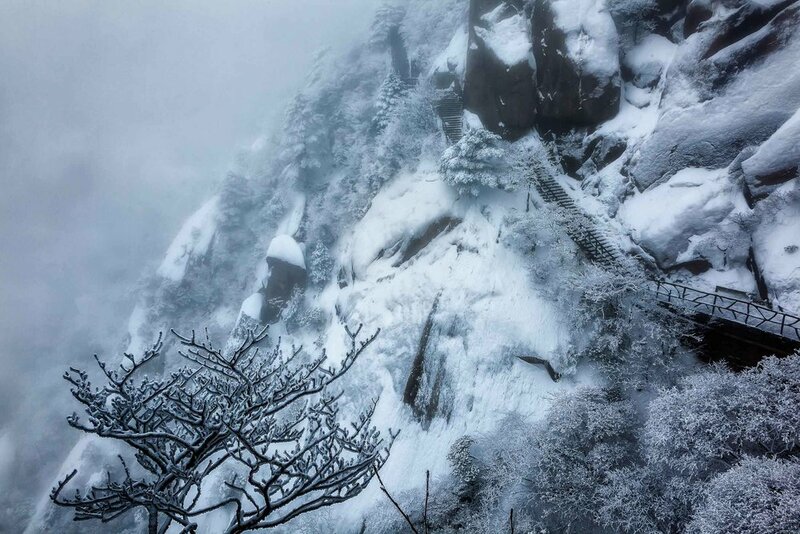 Deep snow and encroaching mist almost hide a path, clinging to the side of the mountain, on Huangshan (i.e., Yellow Mountain) in China in the middle of winter. The 3 days I spent hiking and photographing across the top of Yellow Mountain were 3 of the best days of my life. But it wasn’t easy. It was the middle of winter and each day saw me climbing up and down many, many steps in the search of beauty and wonderful photo opportunities. I’d be off before dawn hoping to find a location and weather suitable for great sunrise photos. I’d trudge back to my hotel for breakfast, a shower and a quick rest prior to heading out again into the snow and mist covered landscape. My travels that afternoon would take me onto my next hotel where, after dropping my bags off, I’d head out looking for a sunset. After a sunset session I’d make my way back to the hotel for a meal and shower, prior to collapsing into bed. In fact I didn’t always get back in time for meals and, as it was very much the off season, the cooks kept their kitchens open only for the minimum amount of time they were required to do so. After that they were off quicker than you could say, “tools down lads“. 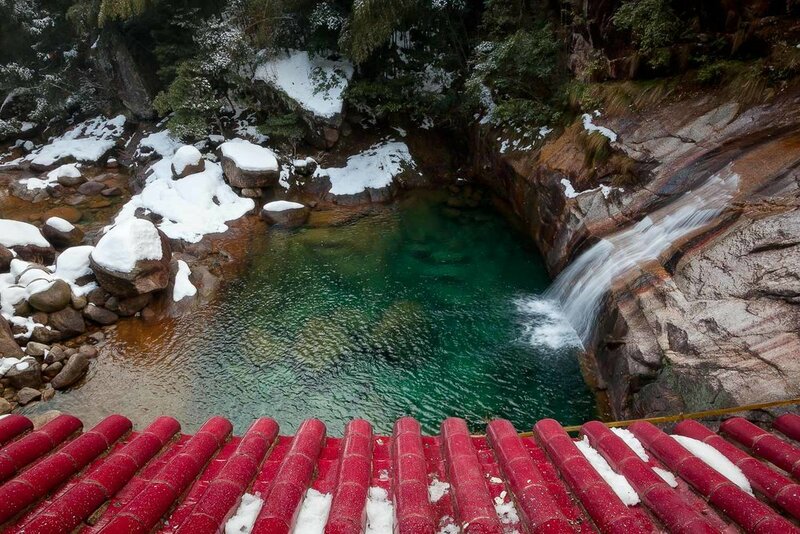 The entrance to one of the hotels I stayed at while traversing Huangshan (i.e., Yellow Moutain) in eastern China. At the end of the day, while disappointing, a missed meal is a small sacrifice to make. What’s more missing a meal makes me even more grateful for that night’s hot shower and warm bed. I don’t travel for a holiday and my trips aren’t based around fine dinning experiences. I’m a photographer and, at the end of the day, I travel to photograph the beauty of our world and its people and to share my experiences here with you. I think that’s a very important mission, which is why I’m doing all I can to continue to live that dream. Being able to identify why it is that you travel really helps diminish any negativity that might follow on from those less than ideal experiences you’ll face along your own journey. Unless, of course, you’d prefer to spend your life going on about what makes you unhappy. I choose to celebrate the good memories and am usually able to find a way to laugh about the rest. It’s all a matter of perspective and asking yourself why you feel the way you do, rather than concerning yourself with what’s happening to and around you all the time. No matter how difficult life can be I never want to consider myself a victim. Particularly after I’ve had the privilege to see how hard life is for so many folks born into less fortunate circumstances than my own. I have my parents to thank for that most essential insight.